Broket tablet: Each tablet contains Ketotifen Fumarate BP 1.38 mg equivalent to 1 mg Ketotifen. 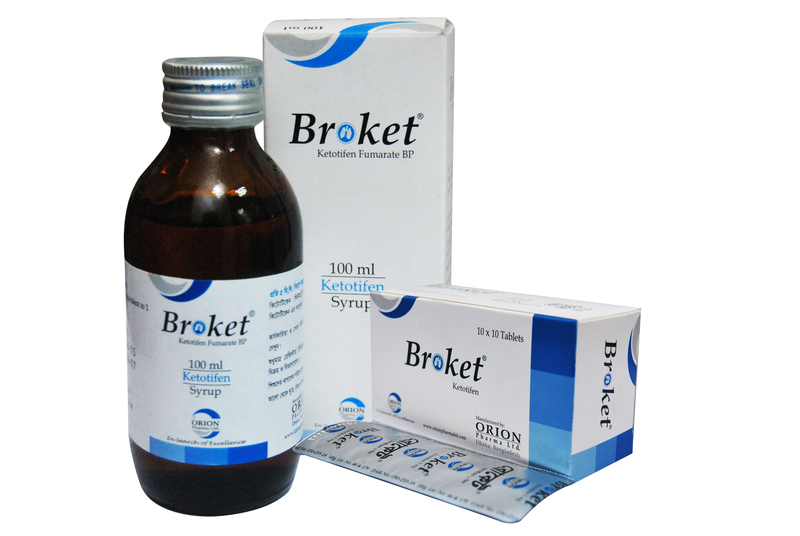 Broket syrup: Each 5 ml contains Ketotifen Fumarate BP 1.38 mg equivalent to 1 mg Ketotifen. Prophylactic treatment of bronchial asthma. Symptomatic treatment of allergic conditions including rhinitis and conjunctivitis. When drowsiness could be a hazard. 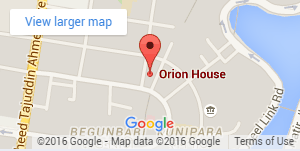 Concomitantly with oral antidiabetic agents. Hypersensitivity to Ketoitfen or any of the excipients. Adults: 1 mg twice daily with food. If necessary the dose may be increased to 2 mg twice daily in severe cases. Children above 2 years: 1 mg twice daily with food. Patient\\\'s known to be easily sedated should begin treatment with 0.5 to 1 mg at night for the first few days or as directed by the physician. Use in elderly: Same as adult dose or as advised by the physician. Drowsiness and in isolated cases, dry mouth and slight dizziness may occur at the beginning of treatment, but usually disappear spontaneously after a few days. Ketotifen is not effective in preventing or treating acute asthma attacks. Convulsions have been reported very rarely during therapy. Thrombocytopenia may occur in patients taking Ketotifen at the same time as oral antidiabetic drugs. The simultaneous administration of these drugs should therefore be avoided. Patients with rare hereditary problems of fructose intolerance should not take this medicine. Harmful for those suffering from alcoholism. To be taken into account in pregnant or breast-feeding women, children and high-risk groups such as patients with liver disease, or epilepsy. It may cause allergic reactions (possibly delayed). In diabetic patients, the carbohydrate content of the syrup (5 ml = 3 g carbohydrate) should be taken into consideration. Potentially hazards interactions: A reversible fall in platelet counts has been reported in a few patients receiving Ketotifen concomitantly with oral antidiabetic agents. The mechanism of this reaction is unknown and therefore Ketotifen should not be used when oral antidiabetics are being administered. Potentially useful interactions: No potentially useful drug interactions are known. Broket tablet: Box containing 10 blister strips of 10 tablets. Broket syrup: 100 ml syrup in amber glass bottle.